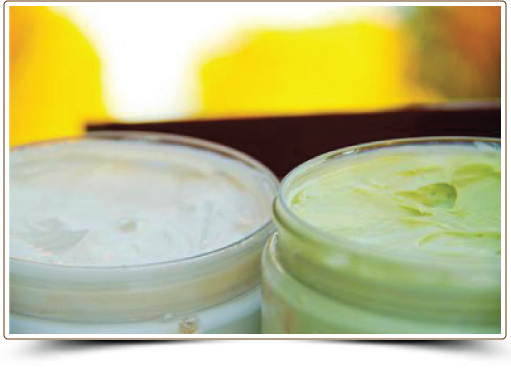 If you prefer creams over lotions or oils, and when extra moisturizing is necessary, there are two effective creams for you to choose from: Luxurious Body & Massage Cream and Creamy Body & Massage Butter. The Luxurious Body & Massage Cream is highly emollient, has a lighter texture and any scent you choose will work well with the blend. The Creamy Body & Massage Butter is thicker and full of vegetable butters so the richness and scent of the butters come through the blend, therefore, hardy, more intense scents work the best. This exceptionally rich and thick cream was created with vegetable butters of mango, shea and cocoa, beneficial oils of avocado, sesame, sweet almond, grape seed and botanical extracts of chamomile, lavender and lemon balm. Mango butter helps restore elasticity, as well as lends protection against the sun. With continued use, your skin will look and feel perceptibly smoother, with improved texture and moisture-balance. Leaves your skin nourished and silky smooth. Available in the hardy scent of your choice that will mix well with the natural aroma of the vegetables in the blend.